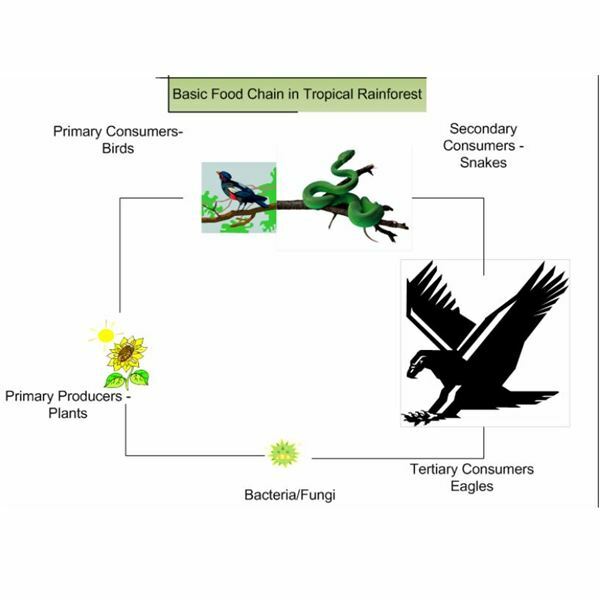 The tropical rainforest food chain is largely influenced by communities of microorganisms and their basic functions as decomposers. Decaying matter is broken down into nutrients during the microbe’s feeding process, which consequentially produces waste containing nutrients that will be released into the soil. Plants need these nutrients for their growth and propagation, being the primary producers of food in the supply chain system. Plants play important roles as providers of nourishment to every member of an ecological community, whether directly or indirectly. Microorganisms are scientifically known as heterotrophs, or those that belong to the consumer groups of the food chain. The most common examples of heterotrophic microorganisms are fungi and bacteria. Fungi are known for their characteristics as single-celled yeasts or molds with rigid wall-cells that also function as decomposers. Bacteria are also single-celled microorganisms but they are self-sufficient and can subsist independently. These single-celled microorganisms are the most basic in the food chain and are said to be the first life forms on Earth. Their primary role in the food system is that of a consumer, but they feed on rotten and decaying organic matters. The different feeding systems in a forest’s ecological communities are linked together, thus forming a greater system known as the food web. The destruction of one system or the extinction of one species could create a chain of disruptions or extinction in the entire natural environment. 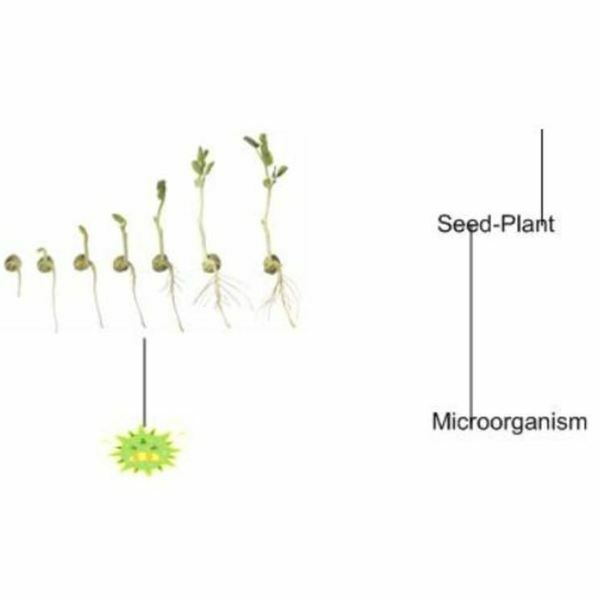 The system starts with a primary life form that is capable of producing its own food with the help of sunlight, hydrothermal energy or natural chemicals in the form of enzymes – they are scientifically known as the autotrophs. The most common autotrophs are plants, and are classified as such because of their ability to produce their own food by interacting with the sun’s energy and the atmospheric gases. All plants are said to have evolved from algae, as they are cellular plants that have no roots, stems or flowers. They are found almost everywhere but more abundantly in bodies of fresh and salt water and in moist areas of the land, like the tropical rainforests. Other plants similar to algae are moss and liverwurst. All of them play important roles as basic food producers for different types of food chains. Plant eating animals or herbivores have different digestive systems and are mostly of the mammalian order. Herbivores like horses, rabbits and kangaroos feed on the shoots and leaves of plants. Those that have more specialized digestive capabilities, like certain rodent species and some bird variety, feed on seeds or fruits, as they contain more nutrients than leaves. Other types of birds, tropical bats, and primates like apes as well as monkeys, prefer the fruit part of plants, its nectar and its pollen. 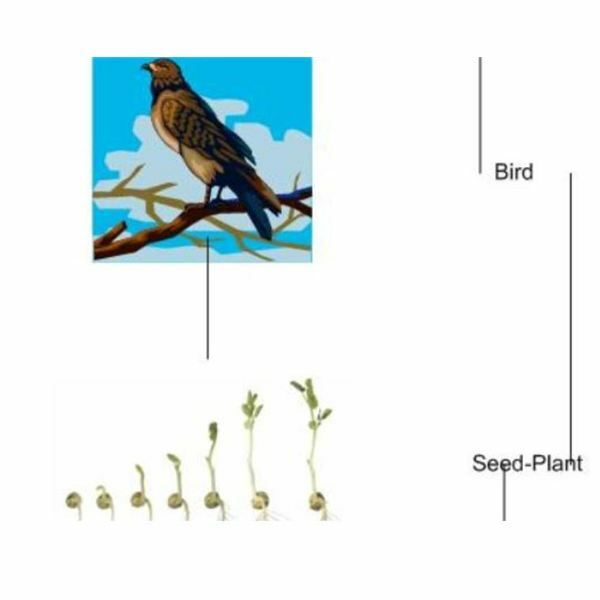 Although most birds eat seeds throughout the year, they will feed on insects if seeds are scarce. The robust and massive elephants are herbivores and can eat up to 300 kilograms or around 660 pounds of vegetables in just one day. Indian elephants in tropical forests like those found in the jungle forests of Myanmar (formerly Burma) and in Sumatra are smaller than African elephants. The Indian class eats at least 150 kilograms or 330 pounds of vegetables in a day. Other known herbivores found in tropical rainforests are river fishes, frogs, possum, squirrels, chipmunks, voles, wallabies and bandicoots, just to mention a few. The secondary consumers in a tropical rainforest food chain are predatory in nature and are classified as carnivores or meat-eating animals. These animals often come in sizes or shapes that fool unknowing prey. As smaller-sized carnivores, they often possess their own sets of unique skills to trap a quarry or evade their natural predators. 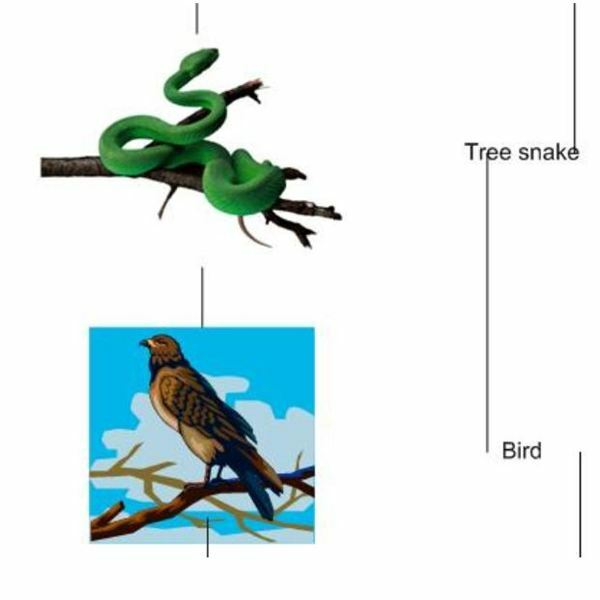 For example, some types of venomous spider prey on birds by weaving webs that are thick and strong enough to trap an unsuspecting bird that perches on a tree. Birds nest in the upper leaves and branches of the tropical trees to protect their eggs or hatchlings. Yet a cunning tree snake that discovers the nest will lie in wait unnoticed, until it can feed on the eggs or hatchlings in the most opportune time. These secondary consumers find it necessary to use the same skills to avoid their own predators. Larger–sized marauders can easily lay claim over the smaller-sized carnivores as their food in an ecosystem’s supply chain. 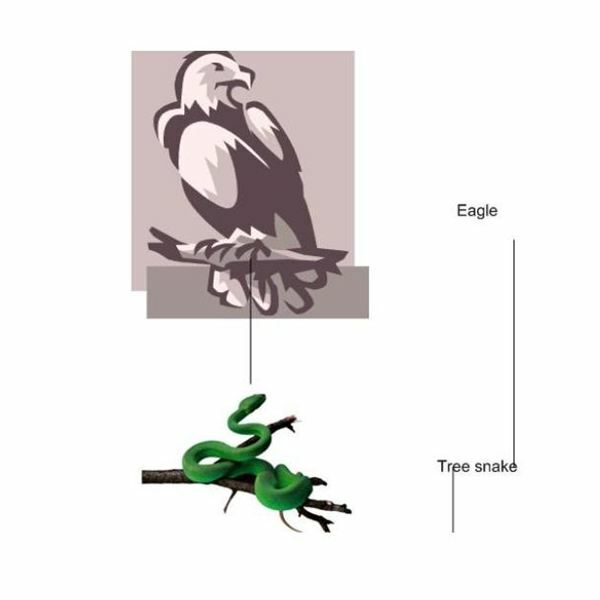 Hence, a tree-climbing snake also has to be careful while scavenging or hunting for food while atop the tree’s canopy – since an eagle, flying overhead, can easily sweep down on the snake and claim it as its prey. The eagle is a tertiary consumer. These carnivores are at the top of the food chain in the tropical rainforest, as they feed on the secondary consumers. In other forms of ecosystems, there are quaternary consumers that pose a threat to the tertiary consumers. Eagles, jaguars and lions are the most common examples of tertiary consumers in the tropical rainforest food chain, since they tend to be stronger and more ferocious. However, lions are not among the dwellers of a rainforest since they are more acclimatized to dry forests, thick brushes and wide open plains. Jaguars, however, prefer to live in wet lowlands, like in the savannahs and rainforests. A jaguar eats around 80 different varieties of secondary consumers as its prey. They hunt and stalk animals like their favorite deer, tapirs, birds, monkeys, turtles, fish, rodents and even cattle, horses, or sheep if ever they chance upon one. It is said that they rarely initiate human attacks and will do so only if they sense that they are being hunted or about to be attacked. Jaguars often hide in caves. Most tertiary consumers have become endangered, as humans hunt them down for their furs and as formidable prize catches in hunting expeditions. 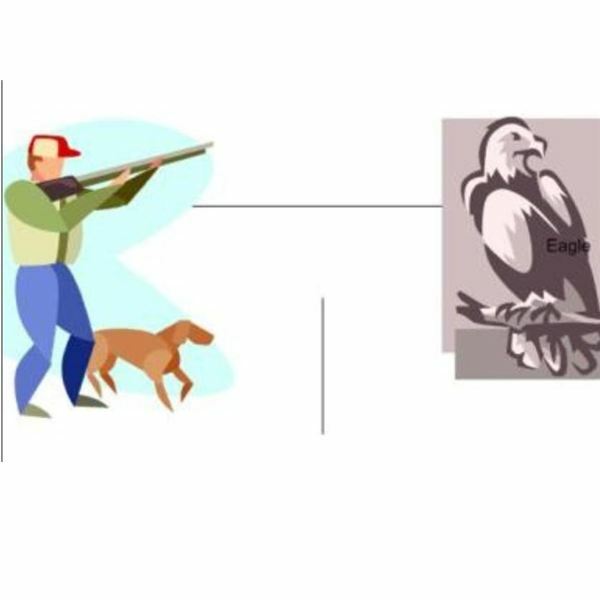 Eagles have been driven out of their natural habitats, as forest lands have been cleared-out for commercial purposes. The last in the order of hierarchy are the quaternary consumers. They are at the topmost level of the food chain and have no predators with which to contend. This group is represented by the large non-poisonous but incredibly strong constrictors like the boas and pythons. There are the huge swamp-crocodiles as well as the indigenous tribes who have mastered their hunting and entrapment skills in capturing larger prey. Although the number of quaternary consumers is relatively few, they have the ability to dominate the environment because of their extraordinary strength or skills. In addition, humans, represented by large mining, logging and farming companies have been successful in dominating some of the world’s rainforests. They have created roads that cut into forest areas, and have caused rainforest “fragmentation.” Studies have ascertained that this has caused the separation of some animal species from their natural sources of food as well as destruction of their habitats. For instance, Asian elephants and orangutans are being threatened by human activities that have destroyed their environment. A separate but related article entitled “How Animals Live in Different Rainforest Environments” furnishes further information on how the elephant’s food supply has been affected. If at the end of the day, all forest animals and plants dwindle and become extinct, the only life forms that will remain in the tropical rainforest food chain are the single-celled fungi, bacteria and similar organisms, since in order to survive, they need only decaying and rotting matter. All images used for illustrating the tropical rainforest food chain, primary producers, as well as primary, secondary, tertiary and quaternary consumers, were created by the author for this article.